MEYRIN, Switzerland -- It's looking a bit less cloudy at the end of the atom smasher. A stately half-century-old particle accelerator, the Proton Synchrotron at CERN -- the European high-energy physics center just north of Geneva -- is used to being outclassed. Its primary job these days is feeding particles to the Large Hadron Collider, the atom smasher made famous this summer by its unveiling of the Higgs boson. It has been a long, long time since the synchrotron made any news of its own. It's been nearly 15 years since Jasper Kirkby, standing by the thermal wall of his chamber, first proposed the CLOUD experiment. All photos by Paul Voosen. That is, until Jasper Kirkby, a physicist here, hooked up a cloud machine to it. Now this modest accelerator is home to perhaps the most controversial experiment in climate science. Using a proton beam, Kirkby and his peers are testing how the cosmic rays streaming into the Earth's atmosphere from the galaxy beyond may be boosting the creation of clouds. And they are making discoveries on a monthly basis. "Almost every run we've done so far ... we're finding totally new things," Kirkby said during a visit to his experiment in July. "The hard thing is keeping up [with the writing]. We have to publish this stuff. And it's very high-profile results." Housed in an industrial warehouse subdivided by towering walls of concrete blocks, used to corral fugitive radiation, Kirkby's cloud chamber is an engineering marvel, its simplest gold-sealed valve costing $20,000. Its silvery thermal casing shimmers amid the synchrotron building's general grime. It's a precision instrument that can sort through gases down to the parts per trillion. Only an outfit like CERN could have built it. "It's an extremely sophisticated experiment, I have to say," said Jan Kazil, a cloud modeler unaffiliated with the project at the University of Colorado, Boulder. "They're doing a really great job. It's probably the best-equipped aerosol chamber." That precision will be necessary. Typically referenced only by its overbearing acronym, CLOUD, Kirkby's experiment is investigating one of the most charged areas of climate science. For as the case for human emissions of carbon dioxide driving climate change has only grown stronger in recent years, cosmic rays have remained one of the few torches left for climate contrarians to carry in their rebuttal of scientific consensus. First posited by Henrik Svensmark, a Danish scientist, the galactic cosmic ray hypothesis charges that the waxing and waning of the magnetic shield cast by the sun over the Earth, and the attendant flux in cosmic radiation, causes shifts in the clouds. And it is these cloud tweaks, not humanity's emission of greenhouse gases, that are behind the spike in global temperatures over the past 50 years, Svensmark said. Nearly every aspect of Svensmark's idea has been debunked by his scientific peers, but his core proposal -- that cosmic rays help some cloud nuclei form -- remains a matter of genuine intrigue, if one obscured by a veneer of pugnacious debate. Last week, when commentators cherry-picked a cosmic-ray reference from a leaked draft of the next U.N. summary of climate science, it is this idea the report's authors were invoking. 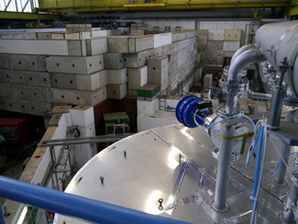 At the top of the chamber, the source for the experiment's radiation is visible, emitted through the black panel beneath the concrete blocks. The most promising results from CLOUD could help finally resolve questions about how the sun's 11-year cycles of activity cause short-term warming and cooling in the lower atmosphere. It could be caused by cosmic rays, a possibility that intrigues Kirkby. But it also could be caused by ultraviolet rays in the stratosphere, or ocean feedbacks, or even fluctuations in something called the global electrical circuit. More than anything else, this is the type of basic science CLOUD is now after. "That's why we set out to do this project at CERN," said Urs Baltensperger, a climate scientist at the Paul Scherrer Institute and Kirkby's collaborator. "[We want] to really get around the quarrel and ... do a scientific project that is simply based on facts. To bring some, let's say, spirit of natural science into this game of belief and disbelief." Indeed, the most important lesson of CLOUD may be the resilience of science, and its openness to provocation and debate. Far from the closed cabal painted by contrarians, many scientists were intrigued by Svensmark's proposal when it first came out. And Kirkby's experiment, though it has shed its associations with Svensmark, still owes its existence, and future discoveries, in some part to his challenge. It's how science, at its best, works, said Gavin Schmidt, a NASA climate modeler. "Scientists look into things without regards of the person proposing them," he said. 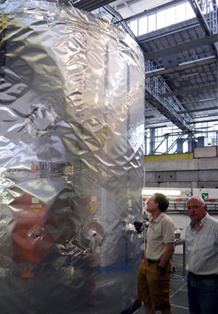 It's not obvious, but CERN's construction of a cloud chamber is a homecoming of sorts. The foundations of modern physics were laid with clouds. In the 1890s, Charles Wilson, a Scottish physicist, stood on Ben Nevis, his country's highest peak, and was so overcome by the coronas and glories of the clouds that he decided to re-create them in the lab. After a few months of work on his machine, a design that remains fundamentally unchanged today, he surmised that clouds formed around bits of particles -- cloud nuclei. 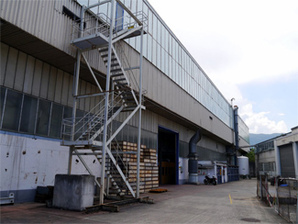 Like many physics labs, CERN doesn't care much about the look of its buildings, as seen by the exterior of CLOUD's warehouse. Scientists had just discovered radiation, and Wilson soon found that more cloud nuclei formed in his chamber when exposed to X-rays, their remnant electric charge bringing gas particles together. Wilson, it turns out, had invented the perfect vessel for detecting and photographing evidence of radiation. The chamber elucidated many early findings, like the positron. Ernest Rutherford called it the best instrument in scientific history. Kirkby was well aware of this history when he first proposed CLOUD in the late 1990s. "The business of CERN is not climate science," he said, "but cosmic rays." It's easy enough to forget, but the world is awash in radiation. Humanity is constantly bombarded by charged particles that stream in from obscure origins -- exploding stars? black holes? -- beyond the solar system. On the way down, this radiation scatters and reflects off the atmosphere, which is why residents of Denver are exposed to more radiation than those in New Orleans. And even before they reach the planet, these salvos are moderated by the sun and its ever-present magnetic field. Scientists had speculated off and on for decades that cosmic rays, following what Wilson saw in his chamber, could play a role in how nanoparticles in the air merge to eventually form cloud nuclei. But none suggested the rays could cause global warming. That came only when Svensmark, the Danish scientist, published a study in 1997 finding a correlation between the cosmic ray flux and shifts in the satellite record of clouds. These shifts, in turn, were behind unprecedented warming, he said. It's a hypothesis he continues to hold as true, Svensmark wrote in a brief email. "When I first came out with the idea ... I was told that it must be wrong since no mechanism is known that links clouds and cosmic rays," he said. His own experiments have since confirmed a link, and soon the wide opposition to his views will be proved wrong, he said. "I certainly know all the literature and our own results, and [I'm] confident that in a year or two that view will look silly." It's difficult to unearth the heated personal opposition Svensmark might have faced, but many researchers took up his scientific challenge. They showed that neither the sun's magnetic field nor the flux of cosmic rays has changed appreciably over recent records, trends necessary to tie cloud changes to the sun. And it became increasingly apparent that the unreliable satellite data cited by Svensmark did not show a true link, said Ben Laken, an atmospheric scientist at the Institute of Astrophysics in the Canary Islands. "We've realized more and more [that] this correlation doesn't exist," he said. Satellite data are notoriously fickle and difficult to interpret, and what Svensmark saw was a statistical artifact, Laken said. No evidence for the connection can be seen in short-term changes in the sun's activity, either, like solar flares, which can cause rapid daylong shifts in cosmic rays. Laken has also examined a second satellite data set, called MODIS, and still found no evidence of a correlation. All this lack of evidence doesn't disprove the notion that cosmic rays could have some effect on the clouds, Laken hastened to add. But if there is one, it's below all the noise in the satellite records. And that alone means it couldn't be driving climate change; riding beneath the level of detection implies a very small effect, if one exists. Kirkby and Serge Mathot constructed CLOUD with 16 ports on its horizontal plane, ready to accept the lasers and probes used to paw at its interior. Recent work by Svensmark and his team hasn't held up, Laken added. Their statistical methods can resemble the Texas sharpshooter who paints the target on the barn door after he's shot it. His team responds to criticism, reworks its papers, but then ends up with the same results. Yet despite this constant scientific duel, Laken is sympathetic to Svensmark's plight. Right or wrong, it's not easy to disagree with consensus. "I can't imagine how difficult it is to take the volume of criticism he's had," he said. The criticism of Svensmark has remained strong. But it's important to know that the scientific community only turned on him as he grew resistant to evidence, his personality invested in the hypothesis. There's a bit of tragedy to it. Though NASA's Schmidt is less sanguine, arguing that Svensmark needs to get over his "Galileo complex." "There's a very thin line between a tragic figure and a drama queen," Schmidt said. When Kirkby first proposed his cloud chamber, he was sold on Svensmark. The earliest justifications for the experiment eagerly invoke his hypothesis, arguing that CERN's particle beam could provide an ideal radiation source to test it out. Kirkby's first proposal for the project appeared in 2000, yet it was not approved until 2006. Much of this was due to a funding crisis with the LHC, Kirkby said during a walk of the lab's labyrinthine campus, which ignores international borders, stretching into France. "It's really a hell of a long time," he said. "Normally, it would take a year." Dressed in a taupe polo shirt and shorts, like everyone else at CERN, Kirkby was feeling a bit jaunty after the Higgs boson announcement. Stay close, he said, making his way to CLOUD's warehouse. The anonymous gray buildings housing the lab's wonders grew in a sprawl, a rat's nest, with nothing on a Cartesian grid, except the machines, of course. Kirkby expressed affable amazement that no one had tried to take on the cosmic ray connection before his project. The experiment was ahead of its time, he said -- technically, but also in terms of the scientific community accepting its importance. A decade ago, most climate scientists could barely tell you what a cosmic ray was, he said. "The reality is we have well-defined boxes in research," he said. Kirkby himself has had a journey, too, one he elides in conversation. While the funding crisis was quite real, Kirkby has also slowly shed his attachment to Svensmark, who vanished as a collaborator on the chamber years ago. That change, reflecting sound science, bolstered the project's standing, Baltensperger said. "[It had] had a touch of trying to prove the Svensmark hypothesis was right," he said. Free of that burden, CLOUD could then go on to test its defining mystery: how the stew of trace gases in the atmosphere collide and combine to form solid particles and cloud nuclei, possibly with the help of cosmic rays. It became apparent that any test of such rays would require the cleanest and most sensitive chamber ever built. Gases released into it would have to be pristine, uncontaminated. Synthetic air was an absolute necessity. Soon they'll be creating their own water, too. "Concentrations in the atmosphere even at the part-per-trillion level, and some cases below, are determining what the production of these particles [are]," Kirkby said. "And that's a huge technical challenge, to try and reproduce those controlled conditions." The gas system was more complex to assemble than even those used on the LHC, said Serge Mathot, a CERN applied physicist and one of CLOUD's top engineers. All the materials had to be stainless steel, titanium or ceramics -- anything inert to sulfuric acid. Mathot himself led the creation of an elaborate system using 239 fiber-optic lines to pipe ultraviolet light into the chamber without adding heat. And then, of course, there's the matter of simulating the cosmic rays. On the other side of the warehouse's concrete barricades, the accelerator's protons bash into a target, spewing out secondary particles called pions, which are similar to the muons caused by cosmic rays. The cloud chamber is ensconced in a Faraday cage, a conductive chamber that blocks all incoming radiation. Combined with the beam and background cosmic rays, this allows CLOUD to simulate conditions at the surface or up in the atmosphere, while providing a baseline of no radiation at all. 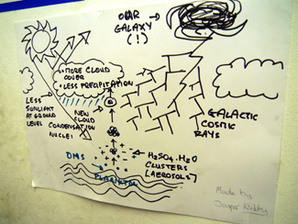 Kirkby lays out the reasons for CLOUD's existence, posted in the experiment's control room. Even for an experiment using a modest amount of radiation, safety warnings loom large on approach to the chamber, which sits elevated, a floor up, on bright blue scaffolding. Access requires a safety key, and if any key is missing, the beam won't start. 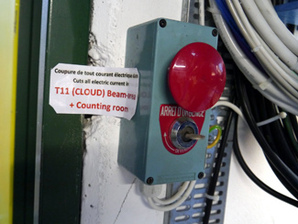 Giant red buttons emblazoned with "ARRET D'URGENCE" pop out of the wall. Like much of CERN's safety equipment, it has a nostalgic, analog feel. Amid all this equipment, the cloud chamber stands like a rotund silver plinth. Not as large as some of its counterparts, it runs 10 feet wide and stands just more than twice Kirkby's height. A quick scamper up an enclosed ladder brings Kirkby to the chamber's top, where they've just installed a pressure system that Wilson would be proud to see. It was the final piece needed to go all the way from trace gases to full clouds. 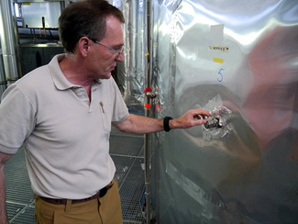 This summer, they wrapped up the first trial of the full cloud chamber, Kirkby said. "It was supposed to be a technical run," he said, "but we've got some papers from it." And if those papers are anything like Kirkby's first, they could shake up cloud science. The experiment's first exposure to the wider world had a "Rashomon" feel to it. During the summer of 2011, the team published a major paper in Nature. It had found that, in its chamber, the two gases commonly thought to bond into solid nanoparticles, sulfuric acid and ammonia, couldn't combine enough on their own to account for aerosol rates seen in the lower atmosphere. Also, the team found that rays boosted the creation of these nanoparticles by up to a factor of 10 in some cases. "What we've found in these very first measurements is that we've actually taken a giant step backwards, because before we started CLOUD, we thought we knew what the vapors were," Kirkby said. "Now we don't even know what the vapors are." The paper caused a stir among cloud scientists for its instrumental clarity. (It's been cited 96 times.) It didn't say anything about how cosmic rays could influence the climate, however, as there's a gulf in size between nanoparticles and cloud nuclei. But that didn't stop a wave of misinterpretation, reporters and bloggers extrapolating on the study to say that rays did or did not cause clouds, ignoring its results on trace gases. With its expansion into a full-fledged cloud chamber, Kirkby and company hope to soon chart that evolution from nanoparticle to cloud nucleus. (They may have already. They are notoriously tight with their findings.) But until the experiment finds its way there, modelers like Boulder's Kazil have done their best to study how the wax and wane of cosmic rays could cause changes in aerosol amounts. It's a long journey from nanoparticle to a cloud nucleus. Gases that bond through ionization must grow from 1 or 2 nanometers to 50 or 60 nanometers before they can support a water droplet. That growth can take days, and it could be that nanoparticles bonded this way won't develop into nuclei. Or they could be overcome by coagulation -- even without a charge, gas particles are known to start sticking together. And all of these gas particles face competition from sea salt, dust and other potential cloud nuclei. "There's this competition toward becoming a cloud," Kazil said. Despite all these hurdles, Kazil's model did, in fact, find that swings in cosmic rays influence aerosol abundance. But the effect was small, swinging the amount of particles by up to 2 percent in the atmosphere, especially close to the poles, where cosmic rays have an easier path through the air. And it remains uncertain how much changes in aerosol abundance actually cause cloud behavior to shift (Greenwire, Nov. 13). Like Kirkby, Kazil hopes CLOUD will help resolve just how decadal swings in the sun's activity cause appreciable but small shifts in surface temperatures beyond what its radiance would imply. The sun's influence over cosmic rays could provide that boost. Or it could be that swings in ultraviolet light warm the stratosphere, connecting to weather down below. Or the sun could heat oceans especially well, goosing evaporation and temperature. Or it could run interference with the global electric circuit that is driven by charged clouds in the tropics. Suffice to say, it won't be easy figuring out how these four pathways play together. But this is what climate science looks like in the 21st century. The work is never done. At CERN, radiation safety always comes first. Over the next year, as CERN retools its particle accelerators to reach maximum energy on the Large Hadron Collider, Kirkby and his team will sift through their mass of data, and they may finally start providing some answers. He's coy but hints that the group knows organic vapors -- emissions from trees or phytoplankton -- are influential in nanoparticle growth. There are murmurs about what the group's next papers will say about cosmic rays and how nanoparticles grow into cloud nuclei, but as of press time, those rumors were not yet ready for daylight. However the evidence shakes out, though, Kirkby's group will report it square. No one is trying to prove anything, he said. "We're completely agnostic," he said. "If we find at the end of doing CLOUD there's no climatically significant effect, then that will be the final outcome. If we find there is a significant effect, then that will be the outcome." "What I am sure about," he continued, "is that CLOUD will answer that question." Final story in a series. Read Part 1, Part 2 and Part 3. Correction: A previous version of this article stated that Svensmark had taken refuge in publications outside peer review. Svensmark continues to publish in peer-reviewed journals, though he has had trouble passing through such review in recent years.